"The Philokalia" is a collection of texts written between the fourth and the fifteenth centuries by spiritual masters of the Orthodox Christian traditon. First published in Greek in 1782, translated into Slavonic and later into Russian, "The Philokalia" has exercised an influence far greater than that of any book other than the Bible in the recent history of the Orthodox Church. It is concerned with themes of universal importance: how man may develop his inner powers and awake from illusion; how he may overcome fragmentation and achieve spiritual wholeness; how he may attain the life of contemplative stillness and union with God. 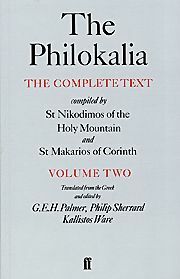 This second volume of "The Philokalia" consists mainly of writings from the seventh century, in particular by St. Maximus the Confessor, the greater part of which has never before been translated into English. Includes introductory notes to each of the writers, a glossary of key terms, and a detailed index. Softbound. 414 pp.